Having seen a multitude of folks attempts at creating an oil anti-surge baffling system, everything from some seriously questionable welded-in plate-work to some madly expensive and sophisticated hinged gates, I applied some thought to it. I like simplicity in all things mechanical, but they have to be efficient obviously. 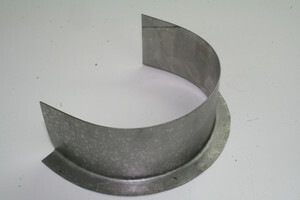 I came up with this, the 'horse shoe' baffle. Simplicity itself, easily bronze-welded (brazed) in to the base of the sump to mostly surround the pick up pipe and screen.